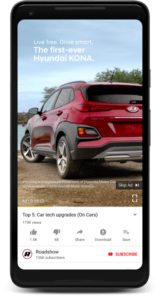 2018 brought many changes to Google Ads. Some of these changes are continuing changes due to consumer trends and others are brand new features. Of course, like every year, we say Goodbye to a few friends, and Google Ads wasn’t any different as it sunsetted two much beloved products and features. Without further ado, let’s count down towards the biggest changes of 2018. You might not consider this a huge change in itself as it is a containing of users allowing more data to be tracked than ever before. However, as the ‘unknown’ category continues to shrink, it makes creating ads specific to age, gender, and other demographic options much more useful. You know someone is really thinking about the account when you have different ads by demographic categories. When ETAs first rolled out, they were one of the biggest changes of the year as it was the first time in over ten years that Google had changed the ad format. However, ETAs getting a 3rd headline and 2nd description barely made our list. That’s mostly because the 3rd headline is rarely displayed, so it’s hard to celebrate a change that is barely even used by Google. I can’t stand vertical videos. However, most selfies are vertical and for some reason, people like to watch YouTube while holding their phone vertically instead of in traditional landscape mode. Google finally gave-in to how consumers use their phones and now supports vertical videos. This means that you might need to make the same video twice, once in horizontal and once in vertical format. That’s some extra work that no one wanted. Google Grants is a wonderful program that Google supports – free spend for non-profits. Of course, Google Grants does help Google by giving away what one can only assume is tax deductible money as well as putting auction pressure on other advertisers. If you manage grant accounts, this is your biggest change of the year. Grants went through a huge policy change early in the year that has made grant accounts much harder to manage and keep active. Search goes responsive. We’d like to put responsive search ads higher on our list, but we can’t as they are losing to your well crafted ETAs for many accounts. If Google learns that humans have feelings, are persuaded by messages, and like people to empathize with them, then the machines could use that to figure out ads. For now, computers can mix and match lines, but being creative and crafting great ads is solidly in the realm of the humans right now – the machines have a long way to go to catch a good writer. Your industry is banned (without warning). Your industry is back. Your industry has new regulations. The year started with Rehab clinics being banned and GDPR notices filling our inbox. This was a surprising change. Average position isn’t really average position and the new default metrics should be position absolute top and position top and so forth. It’ll take a long time for old timers to adopt this, but not nearly as difficult as another change on our countdown that we think will be much harder to adopt. To me this is a Google Ads representative telling me that a person setting bids manually, using bid adjustments, and then letting the computer just change the bid as needed is much better than just turning over the entire bidding to the machine. Google reps are telling us that humans are better than Google’s machine learning algos for bidding. 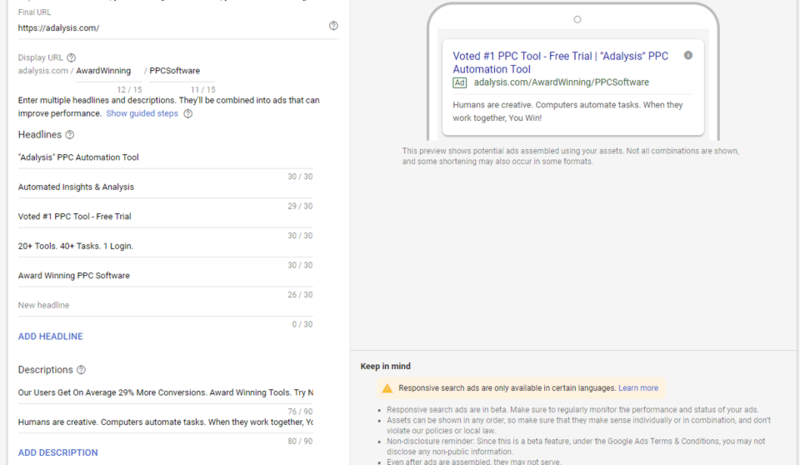 I don’t think that’s what the engineers at Google really think but I’ve been amazed at how much Google Reps have talked down automated bidding and talked up eCPC. 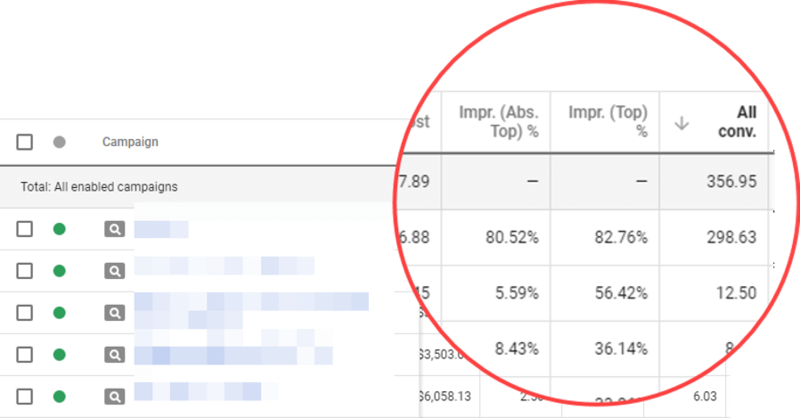 This was finally the year we started seeing Google’s automated ROAS start to do some good work (when you have a lot of volume) after this system struggled for years. Just having Google reps tell us, in a machine learning dominated conversation world, that us humans setting bids and letting the computers just modify them a bit is better than turning over everything to the machine has to make the list somewhere. With the new UI, the recommendations that Google has given for several years became a major part of the new interface. Where I find it amusing is when two of them contradict each other. Get use to more recommendations than you know what to deal with. I think this is going to be a major push across not just Google Ads; but Google AdWords software providers as well. At Adalysis, we’ve been giving recommendations for years. We do it all based upon your actual data – a huge change from just following best practices that may or may not apply to your actual account. I think learning to evaluate and manage recommendations is going to be such a huge trend. It’s my personal 2019 prediction. Some of you love it. Some of you hate it. None of the opinions matter – it’s here to stay. The old UI is gone. We just wish that Google would show some data like the old UI as in the new one, if you aren’t careful – you’ll miss some huge trends and easily make data mistakes. Every year we have to say goodbye to some much beloved features. First we had the Ad Planner, which had amazing demographic insights into various placements. A truly wonderful tool. Then it was removed. Then we had the Display Planner to determine display buys. Unfortunately, the Display Planner did not make the new UI cut and is no longer. If you’re trying to do some good display research to figure out how you want to target the display network – you need to use non-Google tools these days. While the Display Planner was a big loss, the next one took us by surprise. The first thing we did to every single display campaign was add the negative placement AdSenseForMobileAPPS.com. This simple act would get rid of all those terrible app placement ads. It was suddenly removed this year and now you have to manage all your negative placements individually. Yes, Google gave you a lot of work if you want to run display ads on mobile devices. For some the answer was just to simply turn off mobile display. When this change went into place, a funny thing happened. We started getting Android Operating System visits from Desktop devices. No one seems to know what these are. For us, we do very little mobile advertising (no one wants to start a software trial on a mobile device) but evidently AdSenseForMobileApps.com was blocking some desktop visits. I guess somewhere there are mobile apps being run on desktop devices showing Google ads. Blocking mobile doesn’t help, so you need to block the app or app type in other settings. While saying goodbye to old friends is hard, sometimes you don’t know how to express it when your friend suddenly changes into something totally unrecognizable. That was has happened with the exact match changes (commentary, examples, and solutions here). There is no longer an exact match and it is easy to argue that phrase match offers the most control for advertisers these days. We had thought, outside of a few odd instances, phrase match was going to be replaced by modified broad match for most advertisers. While modified broad is doing an admirable job, exact match is now often terrible for many people, and phrase match is making a comeback. We’ll have to watch these changes closely through 2019 to see if phrase match remains a syntactic match type or becomes a semantic match type. I opened my first Google AdWords account in 2002. It was a CPM buy done through an insertion order. 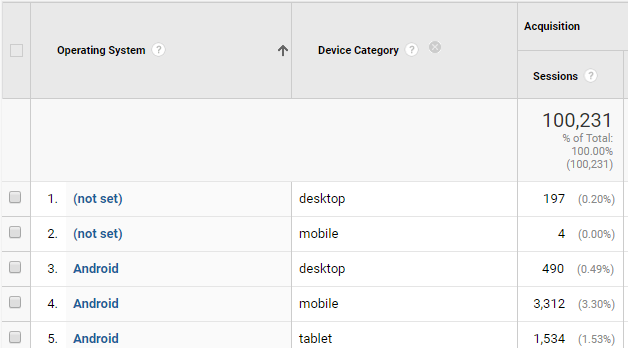 For a while I had to distinguish between AdWords and AdWords Select (select was the initial name of the CPC system), until the CPM version of AdWords was sunsetted and AdWords select was renamed to AdWords. After saying Google AdWords for 14 years this is going to be hard habit to break as there is no more AdWords. Our top change has to be AdWords going away and being rebranded as Google Ads. The search volume tells us, even a few months after the change that more people are still searching AdWords than Google Ads. That’s sure to change in the next year as we say goodbye to AdWords and hello to Google Ads. There are definitely more, such as parallel tracking changes, the message extension gets more talkative, new YouTube ad serving, video ad sequencing, target impression share bidding, more in-store visit data, smart bidding for search partners, showcase shopping ads, and the list goes on and on and on, but we had to narrow this down to the 13 that make the biggest impact for most advertisers. Did we miss any big changes that are really affecting your PPC management? Particularly, your observation on eCPC and its implication for manual vs. automated bidding is enlightening. I’m always surprised to hear young Google reps encouraging to set up as many audience lists as possible in fully automated Target CPA bidding to “help” the machine-learning algorithm, and at the same time deriding manual bidding and using extensive bid adjustments as being hopelessly outdated. One major loss in functionality with the new interface is the ability to sort on ad groups/campaigns (typically by cost descending), then click into the top of the list (to work on keyword bidding, ad optimization, whatever), and then click the ‘next’ icon to advance to the next campaign/ad group in your sorted list. Anyone agree? But still, there’s hope for the future (I guess!). the removal of the adsenseformobile as an excluded placements is a big one as well. I have been trying to work out how to create a huge list of the most irrelevant app placements (Or any means possible)- so I can block this from day one – instead of waiting for machine learning.